The Museum for African Art is pleased to announce a new postdoctoral fellowship funded by The Andrew W. Mellon Foundation. The Curatorial Fellow will be a postdoctoral scholar (ABD considered) who possesses a strong knowledge of the field of African Art. Preference will be given to applicants who specialize in art of the African Diaspora. This position calls for a close relationship with exhibition curators to help plan and implement exhibitions and publications. During tenure at the Museum, the Fellow will contribute significantly to the preparation of three to five individual exhibitions. A majority of the Museum for African Art’s exhibitions during the Fellow’s two year appointment will involve guest curators who represent the top of their fields both academically and curatorially. Though the Fellow will be primarily mentored by the Curator of Contemporary Art, the new Associate Curator of Traditional Art, and Associate Director of Curatorial Affairs, (s)he would also have the rate opportunity to work directly with the guest curators in their areas of expertise. The Curatorial Fellow will be encouraged to develop an exhibition in his or her area of expertise, working closely with the Museum for African Art curatorial staff, guest curators and advisors. There is potential for the exhibition and accompanying publications to develop into an exhibition presented by the Museum for African Art at a future date. Grant funds will support travel in pursuit of research. Interested candidates should submit a cover letter, three letters of recommendation (submitted independently by referees with the candidate’s name in the subject line), a short statement describing your area of research and the potential for its development into a museum exhibition, and curriculum vitae by March 10, 2012 to mellonfellowship@africanart.org. African Arts is devoted to the study and discussion of traditional, contemporary, and popular African arts and expressive cultures. Since 1967, African Arts readers have enjoyed high-quality visual depictions, cutting-edge explorations of theory and practice, and critical dialogue. Each issue features a core of peer-reviewed scholarly articles concerning the world’s second largest continent and its diasporas, and provides a host of resources - book and museum exhibition reviews, exhibition previews, features on collections, artist portfolios, dialogue and editorial columns. The journal promotes investigation of the connections between the arts and anthropology, history, language, literature, politics, religion, and sociology. 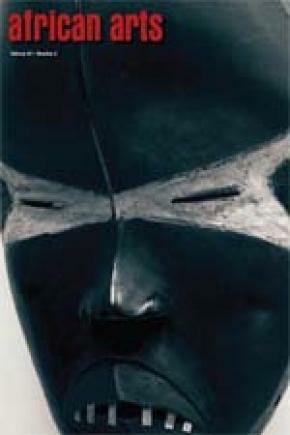 African Arts is published quarterly by the James S. Coleman African Studies Center, UCLA, and distributed by The MIT Press.